Living Better 50+, January 2014. Inspired Women Magazine, March 2012. Ruby for Women, Winter 2014. Living Better 50+, November 2013. Mentoring Moments for Christian Women, October 2013. 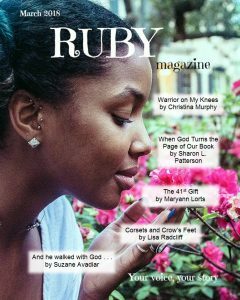 Ruby for Women, May 2013. Mentoring Moments for Christian Women, August 2012. Mentoring Moments for Christian Women, May 2013. Just Between Us, May 2013. Mentoring Moments for Christian Women, April 2013. Mentoring Moments for Christian Women, March 2013. Mentoring Moments for Christian Women, February 2013. Mentoring Moments for Christian Women, January 2013. Seventh Annual Christmas Story Contest by JournEzine and Heart of God International Ministries, December 2012. Mentoring Moments for Christian Women, December 2012. Ruby for Women, December 2012. Living Better at 50+, November 2012. Mentoring Moments for Christian Women, November 2012. Mentoring Moments for Christian Women, October 2012. Inspired Women Magazine, September/October 2012. Mentoring Moments for Christian Women, July 2012. The Best of Inspired Women Magazine, July 2012. Living Better at 50+, June 2012. Mentoring Moments for Christian Women, June 2012. Inspired Women Magazine, June 2012. Under the Rainbow, May 2012. Mentoring Moments for Christian Women, April 2012. Women of Divine Aspiration: Chronicles of a Walk with Christ, April 2012. Mentoring Moments for Christian Women, February 2012. Women of the Secret Place (Ambassador International), January 2012. Inspired Women Magazine, June 2009. Mentoring Moments for Christian Women, January 2012. Mentoring Moments for Christian Women, November 2011. Inspired Women Magazine, April 2010. Celebrate Recovery at First Baptist Church at the Mall, October 2011. Celebrate Recovery at First Baptist Church at the Mall, August 2011. Mentoring Moments for Christian Women, August 2011. The Christian Journal, October 2009. Faithwebbin Online Magazine, January 2009. Beyond the Bend, August 2008. Mustard Seed Ministries International, August 2008. Daily Devotions for the 2004 Lenten Season, First Baptist Church, Gainesville, Florida.